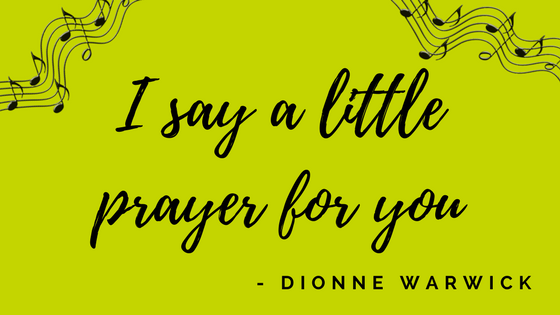 I say a little prayer for you…. I say a prayer for all of the wonderful volunteers and donors who brighten my life each day at Habitat. Where else can you work and meet such amazing people on a regular basis? And how did I ever get so lucky to know them all! Like who? Like our new Board Chairperson, Dr. Cleamon Moorer who has so many ideas that we can hardly keep up. The excitement is infectious! And who else? The three speakers who will inspire us at the Women’s Luncheon on March 7th! Ann Duke, Nancy Faught, and April Chatman! They each have a powerful message to share. One kept a career going while her husband was fading away just a little bit more each day due to cancer. She and her daughter had each other, but what was that really like and what can we learn from such a woman of courage? One broke the glass ceiling in her role as Vice President of a non-traditional field. Hearing her story will encourage other young women to do more to break other ceilings. And finally, one will tell her very personal story of how Habitat and so many others, helped her to a place of homeownership and hope. There will be no dry eyes in the house. None. Some people dread going to work. Not me! As I get ready, I am thinking about all of the grants I might be able to write, the calls I must make, and the people I will thank. Just last week, for example, Passport Pizza came through by donating food for a conference room full of donors and friends who have supported Habitat. The chicken, pasta and salad were scrumptious! I hope you will support them. The partner families we collectively serve will stay in my heart forever. They worked so hard to save their down payments and they volunteered 250 hours of sweat equity before they could purchase their beautiful, safe, energy efficient homes! I admire them and value each of their stories of struggle. From the moment I wake up to the moment I lay my head on my pillow, I am filled with grace and appreciation for the blessings that Habitat brings to me. Join me in any way that best fits your schedule. It will be a journey that will touch your heart forever. P.S. I can’t stop singing this song! !